I wanted to start off my latest travel piece with my experience in Jerusalem, it's been a longstanding dream of mine to see Palestine and visit the places I had heard about in the stories of our prophets. So because this leg of my journey was completely new, with some more life changing experiences , Al Aqsa, Part One is the first instalment. Last year was a huge year for me as I stated in my last post, and we had been discussing the possibility of an Umrah trip all year. However, until November, it didn't look likely and then after a whirlwind of planning, it became a reality. Just like with my Hajj, it was a trip with last minute arrangements, my dates were changing constantly because I was restricted by the late start of school holidays. And then I also needed to be back early enough for the release of my second born's matric results. Life was hectic at the time, work was keeping me busy with some last minute travelling, but Algamdulilah, everything worked out as it should have. Since there were no tour groups departing as early in December as we chose, (I took Ihsaan out of school early 🤦🏻‍♀️) we decided to do Makkah and Madinah on our own and source our own hotels, ziyarahs and transfers. Since we had not travelled to Palestine before (and of course one hears many many stories about the border protocol), we preferred to join a travel group from South Africa. After deciding on an agent, which was the same one we travelled on hajj with, I actually received so many helpful tips from my readers. In hindsight I realised I could just have used that information to do the Aqsa leg on our own. This particular leg of my journey presented many challenges and lessons, and I remain grateful for every single experience. 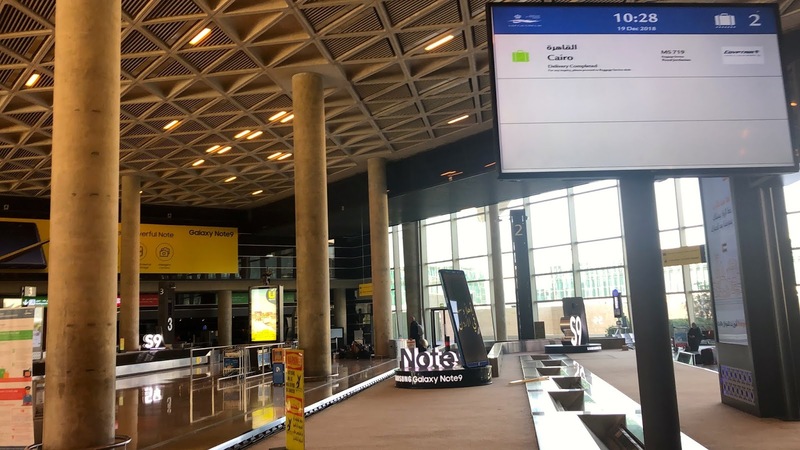 We arrived in Dubai airport early to connect with the agent's group (which we planned to coincide with their flight), after completing our Saudi leg. With intense anticipation, we boarded the plane for the three and a half hour flight. 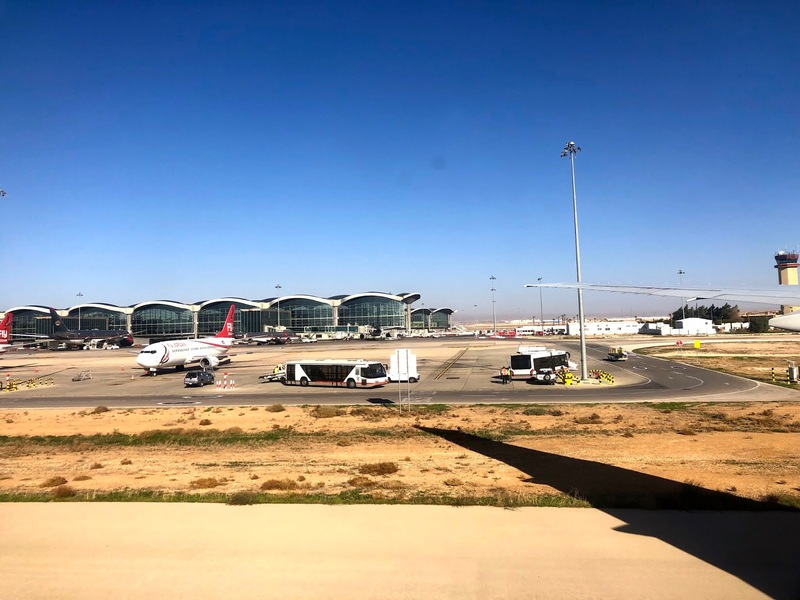 After an uneventful flight we touched down in Amman, Jordan just after 9am. 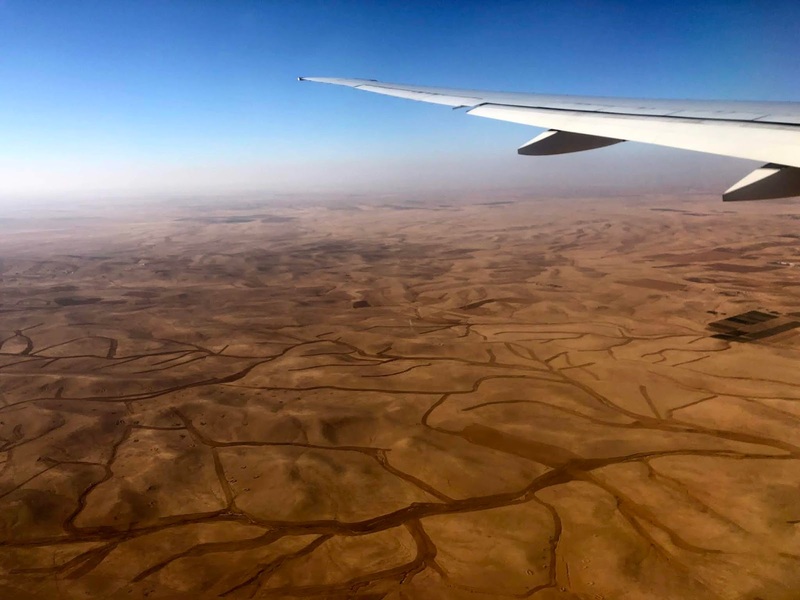 As we approached the airport and taxied down the runway, all I could see was dry, mountainous, sandy terrain - a proper desert country much like the ones you'd see in movies. I was so excited to have arrived in a place which resulted in an Islamic historical tour like no other. We went through immigration and filled with some apprehension, onto a bus headed for the border. Before setting off for our Aqsa leg, we were cautioned by the agent to travel with minimal luggage into Aqsa, this is mainly for ease of movement with your luggage through the ancient cramped streets of the Old City. 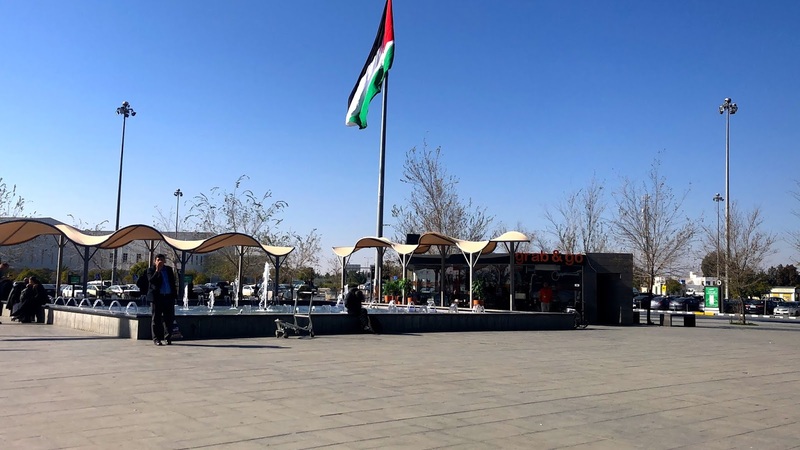 So you can choose a carry on, or a medium sized suitcase, whichever you prefer, or even a normal sized suitcase- as long as it is one suitcase and easy for you to carry/pull along, just be sure to pack enough for the time you'll be in Aqsa. If you're travelling alone and not part of a group, larger luggage pieces will delay you, but with the group you'll be delayed anyway, so it's really your choice. Enroute to the border, after driving for about an hour, we stopped off at a souvenir stop, where you can store any excess luggage which you won't need in Aqsa (this storage comes at a cost of approx US$5 per person). 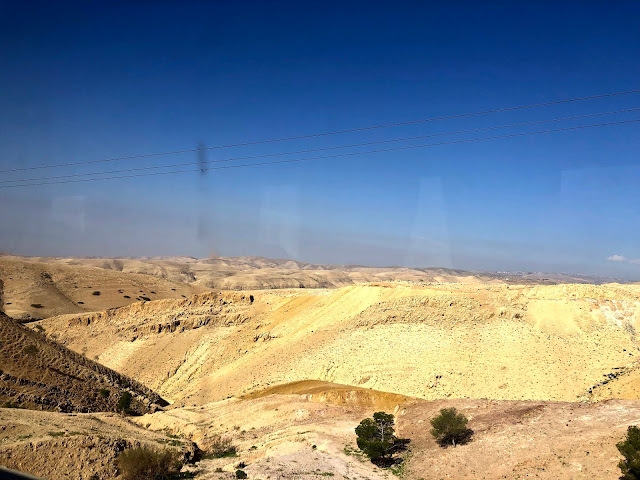 The drive to the Jordanian border took another 2-3hrs, where we then sat in the bus and waited an hour whilst officials checked our passports. Thereafter we proceeded to the Allenby Crossing/King Hussein Bridge heading to the Palestinian terminal. There are several checkpoints that the bus has to go through before arriving at the terminal. Once you arrive, your luggage will be unpacked from the bus. You collect your suitcase and enter the terminal building for the passport, luggage and body check. Ghaalid and my son, Ihsaan, went through pretty smoothly and I just had two extra checks and a scan before I was directed though immigration. A barcoded ticket is issued and stamped (so there's no stamp in your passport) which you keep with you for your stay in Palestine. I breathed a huge sigh of relief as I exited the terminal on the other side... What I didn't realise is that members of our group had been held back for questioning, which meant that we had to wait outside the terminal building until they were released. (So it's a good idea to have a snack bag/ food packed for this wait).This took 3 hours, unfortunately when travelling with groups this process is unavoidable and can sometimes take longer. So the entire process of crossing from the Jordanian terminal to getting on the bus headed for our Aqsa hotel took us around 5-6 hours. It was already dark by the time we boarded the bus to our hotel, around 5:30pm (sunset is around 4:30pm) and we were exhausted and hungry from 18 hours of travelling. After departing from our Madinah hotel at 9pm the night before we arrived at our Aqsa hotel at 7pm. 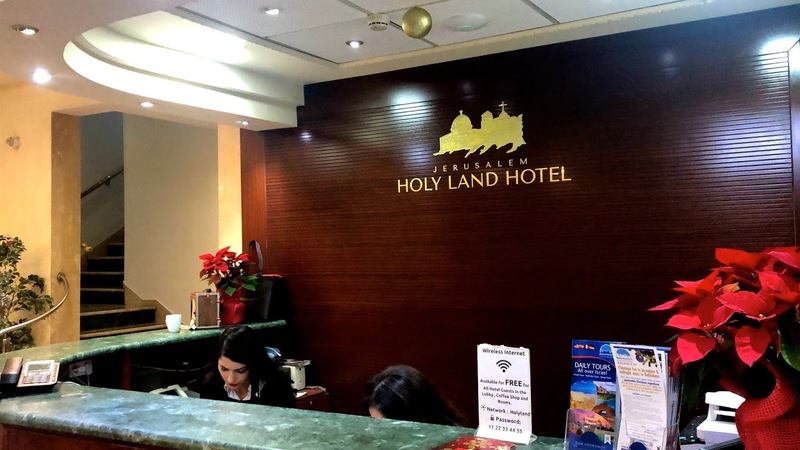 The extreme cold as we disembarked from the bus hit us unexpectedly and we hurried into the warm, toasty, Christmassy lobby of the Holy Land Hotel. Eager to get into a shower, grab proper food (the last meal we had was on the flight for breakfast at 8am) we waited in the lobby for our room key. This was where our challenges started. We were allocated the incorrect room, a double room instead of a triple room, and our 14 year old son had been placed in another room to share with a young man. Upon enquiring with the front desk, it was clear that this was what our agent had booked - without prior discussion with us. This left us in a predicament; tired, starving and short on patience we waited for a further two hours while someone tried to sort it out. By 10pm, there was still no progress, and the stoic faced hotel desk clerk was unable to assist, we begrudgingly decided to take the one double room with the double bed for the one night, and sleep 3 on a bed. There was no way we were going to put Ihsaan in a room with a stranger, nevermind to share a double bed! We also had an early morning to prepare for and could not imagine waiting any longer and losing out on much needed sleep, so we complied, took our luggage, and settled in for the night. The room situation would be addressed in the morning. As I mentioned, this was the start of our logistical challenges, and whilst I was hesitant to even share them - I have recently been told by several families that they have chosen a travel agent based on my recommendation. I therefore feel duty bound to share my full experience, the highs and lows, with the intention of being transparent. Ensure that you have your detailed itinerary at least two weeks before your trip, so you are clear on every little detail. Most agents would mention a hotel with a disclaimer, or similar, which is perfectly fine- just ensure that your room allocation is correct. Once you're in Palestine, it is near impossible to get another room, over Christmas time. I also didn't have any clue which hotels I would be staying at in Amman and Petra- which I only realised when my documents were delivered the night before my departure (without said itinerary). Sit down with your agent and ensure that you will have a representative to assist you with logistical matters whilst abroad. Most of the logistics are managed by a local tour operator, and the agents usually deal directly with them. If the agent's representative is not present, you have no recourse (like with us where we had the incorrect room booked, or my son placed in a room with a stranger), you're merely a third party engaging with the hotel and unlikely to be able to make changes. Discuss the various legs of your trip with your agent, find out how long waiting times are, what the travel times and distances are like so you have a good idea how much time you'll actually have to explore the city. At the end we had 1 day free to explore at our leisure, which was less than I had expected. If you're accustomed to travelling, your experience will mean that you'll easily be able to correct any booking errors, but this will be at your own cost. This was one option we explored in trying to resolve our sleeping arrangements. Without a representative, you may not be privy to the full experience and could miss out on pertinent bits of the trip - I'll clarify this in my next post. Find out the group size that the agent will be taking, if it is too small, your agent will most likely enlist the services of a fellow tour operator to caretake your group in their absence. This did not sit well with me, as I felt at a serious disadvantage having to now deal with an agent (actually his representative who accompanied his Aqsa group), who first needed to attend to his own group, didn't know my booking requirements, and was now accountable to me to correct an obvious booking decision taken by my agent without my knowledge. I was told afterward that my request for a triple room was never secured, and therefore the second double room was booked, to be shared. For first time travellers, or elderly travellers, I feel that it is essential to ensure that the above is in place. Without your agent being present, you will have no knowledge of bus departure times, any changes to your touring schedule or assistance with hotel issues. We experienced numerous challenges as a result of having no agent representation, so I cannot stress the importance of the above points enough if you're keen on travelling with a group. 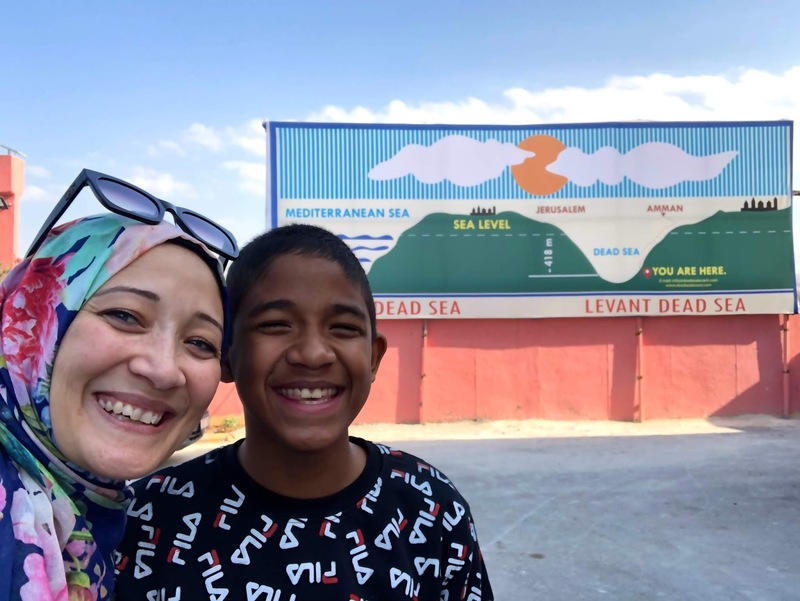 Alternatively, if you feel comfortable enough to travel on your own with your family (without booking through a travel agent), this is an option you may want to explore. You would then have full control of your own accommodation, tours and travel times.